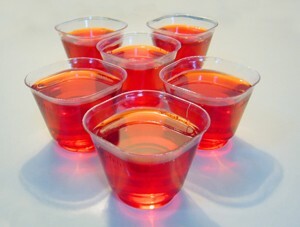 I was browsing around for more ideas on a forum, and somebody had suggested having a themed 21st birthday party with vodka jelly. I thought this was a great idea, and so I had a look for some recipes. Pour 150ml of boiling water into a bowl. Break up the jelly and put in the bowl to dissolve. Add 200ml of cold water. Pour into any moulds and leave in the fridge to set overnight. If you do not have a pack of jelly that is 135g or you would like to make more than this amount then just simply use 80% of the required amount as per the jelly instructions and make up the complete amount using 20% Vodka. It is very important that you do not use too much,too little as the jelly just wont set properly. Good luck and be safe!